And this, ladies, is one of the many reasons why we should't hand any man our happiness. This Rapunzel remake by Carolyn Turgeon is possibly the most depressing book I've read in a long time. THE FAIREST OF THEM ALL has a very interesting premise, weaving classic fairy tales like Rapunzel and Snow White together. This alone made me want to read the book because you have to admit, this twist to a worn-out tale is an attention grabber and CTurgeon didn't disappoint. Plot-wise, CTurgeon didn't deviate too much from the original Rapunzel and Snow White tales. Both women more or less kept close to their true tale. The tone of the story is somber for the most part with a little bit of magic thrown here and there. THE FAIREST OF THEM ALL focused on Rapunzel, her desperation for Prince Josef, the struggle to be accepted by a Kingdom who deems magic and its practitioners evil, her efforts to be a good stepmother to Snow White and the unrequited desire to bear Josef and heir. Rapunzel dealt with a lot of guilt, resentment and whiplash for things she did and cannot do. Her vanity is the result of her insecurities stemming from her inability to bear a child and Josef's countless infidelities. Snow White (I'm not a big fan of her to start with) was a good girl at first but eventually she turned out to be a teenage brat. Can't blame Rapunzel for asking for her heart. CTurgeon threw some shocking surprises further making this remake interesting. My favorite part is Rapunzel's storyline, CTurgeon gave the "evil" stepmother redemption by taking the opportunity to making things right. So even if the tone of the story was leaning towards sad and depressing, I still loved THE FAIREST OF THEM ALL. CTurgeon kept the integrity of the original stories and the creative license she exercised was fantastic. It was hatred made of light, of diamonds, shaped like an arrow moving from my heart to hers. I think I saw this on goodreads awhile ago. 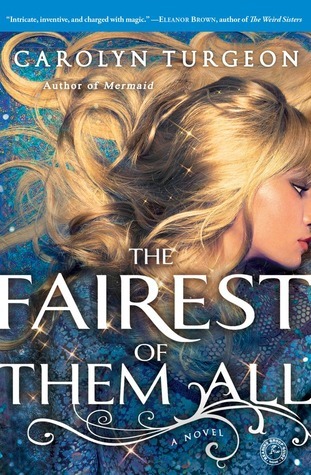 I do love Fairy Tale retellings, it's just one of those things I never really stopped loving. And BTW, I think Buona wants to actually be an extra for the movie haha, and if we do get the chance to meet him I will definitely take a picture of Derek holding a sign for you! OK I look forward to that sign and I hope Buona gets a part! That would be so frickin awesome! Well if that's the case then I'm sure you'll like this. I can tell, thanks for the MHall recommendation! This is one of the better ones. The tone is more Grimm than Disney and I like that better. interesting concept...I like it. I like retellings of fairy tales if they're done right. This one sounds like it is. I'm not big on fairy tale retellings, but I'm not big on fairy tales in general. I just don't like the message. But , I do like the twist in Fairest. Great review, Braine! Yeah, it's so anti-feminist which is why I'm not big on it too. This was a little like that but she threw in a plot twist that left my mouth hanging open for a bit. I haven't read any 'mixed up' fairy tales, but this one sounds intriguing. I'll be sure to check it out. Thanks, Braine. Yea, she really did a good job. When you get the chance to read it, I'm sure you'll understand why. Yeah I saw this too, reminded me I had a copy and it was less than 300 pages so I jumped in and gave it a whirl.